Today was Day #3 of Chocolate and Salt Theme Week. This Salt and Almonds Milk Chocolate bar from Sulpice Chocolat (Barrington, IL) was sealed in a gold inner wrapper. I like attractive design and packaging. However, effective packaging also prolongs freshness. Hand-crafted and folded paper and foil wrappings are nice to look at, but they don't do as much to preserve freshness as sealed wrappers. Today's bar simply tasted fresher. This Non-GMO and Gluten Free milk chocolate bar also had a pleasing design on the bar itself. 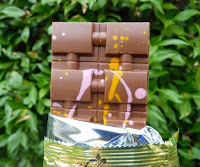 Drizzles of pink and orange cocoa butter "paint" were splashed across the top of this "hand-painted artisan chocolate" bar. 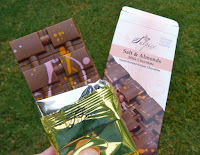 The chocolate itself was thick creamy milk chocolate with a fairly soft "bite." Soy lecithin gave it a very slightly gummy chew, but it was not nearly as bad as some bars in this respect. The salt was enjoyably uniform throughout the bar without being overly salty; and the salt helped balance sweetness. I couldn't really taste any almonds. They could have been in very tiny bits.